༄ Tibetan translation is not easy to find. If you do, it costs at least $10 to $20 to get just ONE word translated. ༄ Pronunciation included so you can read it to your friends - they will think you know Tibetan! 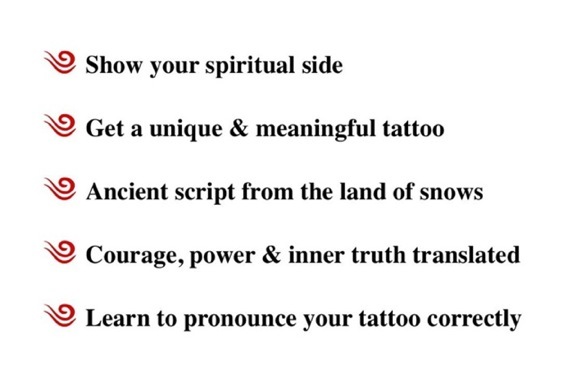 What do you get in your Tibetan Tattoos Sacred Meanings And Designs E-book? First name transliterations - one may be yours! PLUS your two special bonuses...! As tattoo designs, foreign scripts are often selected as a discreet yet aesthetic way of conveying a personal, meaningful or spiritual statement. Being a professional tattoo artist, I think it’s important to properly understand the meaning and tradition behind such writings before choosing it as a tattoo. One would want to ensure the character or symbol’s meaning as well as the respect of its original context. For one interested in beautiful Buddist inspired designs, Tibetan script tattoos can be a refreshing change to the quite popular Japanese kanji. 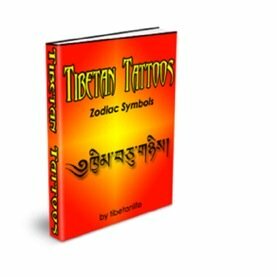 Now with the “Tibetan Tattoos Sacred Meanings And Designs” eBook, it is possible for both tattoo artists and customers to get a deeper appreciation of the Tibetan symbolism. "A well written, thought out and informative e-book, well worth it's weight in gold. This Tibetan Tattoo ebook is something I think every shop should have in it's reference library. I know I am putting it in mine, as a very valuable resource. "This is very good and useful book. I would use this book in my work with great pleasure. Thank you Patricia." "The 'Tibetan Tattoos Sacred meanings and Designs' ebook is the only definitive guide to Tibetan script I have ever seen and gives a great, quick and comprehensive guide to anyone thinking of having some writing done on their body in an unusual, rarely seen script, with a choice of applicable fonts. I shall certainly be keeping it as an unusual option to promote for customers wanting to put writings as a statement on their body. Chinese and Japanese Characters are also very beautiful, but the Tibetan scrips are outstandingly beautiful and feel very unique to the eye." ༄ Just print out the Tibetan script and take it to your favorite tattoo artist! ༄ This amazing e-book will give you many ideas for your next gorgeous tattoo. ༄ Get the correct spelling or the Tibetans will laugh at you! ༄ Be proud and confident of your tattoo, know what it means and how to properly pronounce it! "My husband and I want to commemorate our ten year wedding anniversary with matching tattoos. We hear it is bad luck to put each other's names on our bodies, so we thought if we shared a word of love in Tibetan Script, it would be meaningful and quite lovely for both of us. We were thinking of putting the word love in the Tibetan language down our sides (on the torso, under our arms). After spending a lot of time looking for information, I came across Patricia McCallum's 'Tibetan Tattoos Sacred Meanings And Designs Ebook' (TibetanLife.com). For a nominal fee, I easily downloaded the e-book and found it very helpful . . . especially the part of where the placement of the tattoo should go on the body. If I hadn't downloaded this ebook, I would not have known the correct placement. Thanks to Tibetanlife.com for the help and a personal thanks to Patricia who reached out to me personally after I bought the ebook to make sure I was satisfied. I would high recommend this e-book." "The Tibetan Tattoo book is great...I really found what I was looking for and soon we are going to start the tattoo, can't wait! You should send to all tattoo artists in the world ... a lot would be interested in buying your book!!! Only $16.99 for this amazing 108 page e-book full of great symbols and designs! Be the first of your friends to get an authentic and unique Tibetan tattoo! Are you Libra, Gemini or Aries? No matter... get all 12 awesome Tibetan Sun Signs. An $10 value! even if it's 3 am in the morning! My 100% 30-Day "No Questions Asked Guarantee"